The Cornbelt Diabetes Connection, Inc. (CDC) is a 501(c)(3) charitable not-for-profit corporation chartered in the state of Nebraska. CDC began in 1993 "To provide health care and education about diabetes and related complications to communities and individuals that may not have adequate access to such care or information." CDC has been very successful in achieving this goal in Nebraska and western Iowa. In order to achieve this success CDC has three projects focused on specific areas of the diabetic epidemic. CDC has partnered with the Nebraska Methodist College of Nursing to provide a no-charge dia-betes screening program. 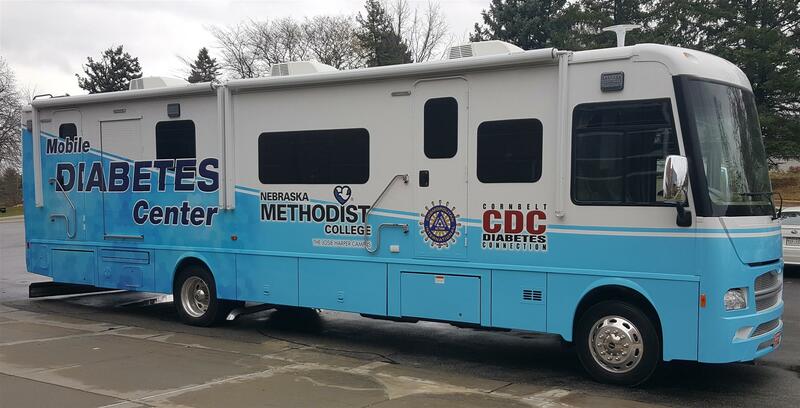 Nebraska Methodist provides nurses and nursing students to staff the Mobile Diabetes Clinic. CDC provides the mobile clinic, driver, fuel, supplies, maintenance and storage for it. The mobile clinic is a 36 foot motor home retrofitted especially for diabetic screening complete with examining table, computer, video equipment and foot examination area. Notably some recent screenings have been done among the native American population which is at greater risk of having diabetes. Foot care examinations are being conducted along with blood glucose screenings using the new Afinion hA1C instrument that allows hemoglobin A1C screenings to replace the fasting glucose procedure. To read more about this partnership and program, click on this link: Mobile-Diabetes-Center. In addition, CDC is affiliated with the Diabetes Education of the Midlands (DECM) to provide diabetes classes where those that would not have otherwise had access to such classes. These classes have shown good results with corresponding reductions in patient weight and A1C blood glucose levels. The third leg of the CDC diabetes efforts is the crisis intervention program which is also conducted in affiliation with DECM. This program offers emergency diabetic medications to desperate applicants for a limited period of time. A CDC volunteer assists with the interview of applicants to insure that they demonstrate appropriate financial need. It has been gratifying to hear the appreciation that many of these needy people have for the emergency assistance that they received. CDC is supported in large part by the Cornbelt Cosmopolitan clubs which accounts for 56% of past revenues. Memorials, gifts and grants make up the remainder of the funding. Notably the Cosmopolitan Diabetes Foundation has granted a significant amount to CDC over the past nineteen years. The CDC grant committee has been actively seeking additional grants for the three primary projects and the anticipated replacement of the mobile clinic from other foundations with some success.